Using a tanning bed can be much more convenient than lying outside for hours on end, however with the extreme concentration of the tanning bulbs, any small issue such as a head phone cord on your shoulder or hair covering your back is going to leave extreme tan lines. This can occur with your eyes also while using tanning goggles. 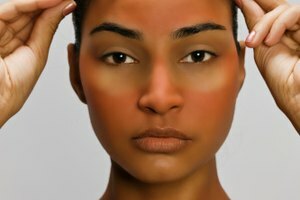 If you are not careful you can end up with a raccoon looking face and white, lighter toned skin around your eyes. Lie down in the tanning bed and place the goggles over your eyes. Goggles without straps are the easiest to use because you won't need to worry about tan lines from the straps. Keep the goggles in place for about a minute or so, then push them up so the bottom tip of the goggles is resting right on the bottom of our eyes (keep your eyes closed). Wait another minute or so, than move the goggles down so the top of the goggles are slightly lower than the top of your eyes. Keep this position for another minute or so. Move the goggles to the right so the left corner of the goggles is right at the corner of the left eye. Hold this for a minute or so, than move the goggles over so the right corner of the goggles is aligned with the corner of your right eye. Moving the goggles around is going to allow the skin directly around your eye to have equal exposure and help you avoid tanning lines.